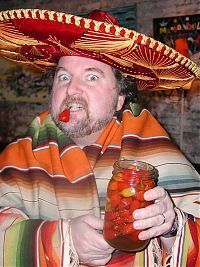 Steve says visit our Family Photo Album or you don’t get a chili! Brown Rice and Sausage Stuffing for your Thanksgiving Turkey! Add sausage to pan and fry until crumbly and done. Drain fat from pan, discard fat and reserve ingredients. Boil water with salt, add brown rice and cook over low heat until water is absorbed, about 35-40 minutes. This is less water and time than normal recommendations. The rice will be slightly al dente, but open. Allow to cool (this stuffing can be prepared overnight and stored in refrigerator). sufficient, and keep the remaining for basting bird while it cooks. Add, to taste, the following ingredients:	Salt	Freshly ground black pepper	Sage	Crushed red pepper	Poultry seasoning Dont be shy! dressing can be put in a pan, covered and baked as a side dish. Bake as you normally would. We like the high temperature method, starting out at 450F, basting with butter and stock every 15 minutes, turning the oven down 25F every time you baste, eventually stopping the temperature at 275F and leaving it there until done to your liking. Thanksgiving table. We Recommend Thomas Family Winery Rio Red!